Even though I'm a mom who reads baby books that say every child develops differently, I am always anxious when I see taller kids, braver kids... and kids who wield pencils with no trouble. I wish I discovered playful learning and Montessori early. Like many moms, I handed a marker to my toddler and I thought that was it. Little did I know that writing is actually a "complex" task and that there are steps in between scribbles and letters that can encourage progress. We started late in terms of age, but it all depends on readiness. Follow your child and all that. But if your child is just a toddler, the most important thing is to make it fun. 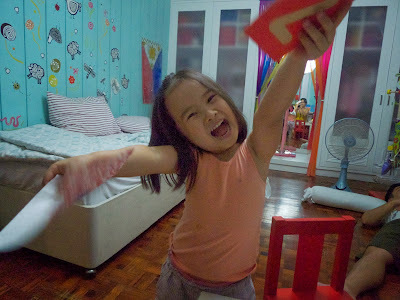 Early this year I sat through twenty painful minutes of watching her listlessly doing letter drills. After this it ruined my impression that Montessori always lets the child choose her own work. I wasn't sure if it was because she was a lefty, her late-blooming dexterity, or because of her shy-away personality from intimidating tasks -- getting her to practice is still a challenge today. Those black scratches are her "words". She finally started recognizable drawings at four years old, but the letters were left behind. So maybe we moms can make practice more fun at home instead. 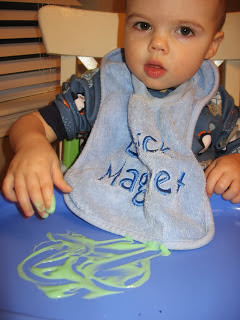 One thing I read about consistently was to let babies and toddlers experience 'writing' using their hands. Markers don't come until later. Wish I knew this earlier! Salt trays are the most common sensorial material - you can leave them out on the playroom shelves, or use them in different ways. Ladybug Girl is drawing a story with chalk pastels -- it colors the salt! A leave-behind activity on her shelf. The timer is for this use here. 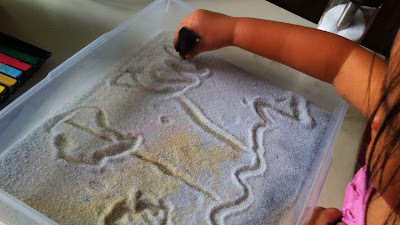 Montessori uses sandpaper letters to start learning the letters. So genius. I found these at zalora.com. If you're feeling up to it, they are easy to make (and teach) with a complete guide here. To make practicing fun, we turn them into silly drawings. Especially those tricky letters she doesn't want to do. Practice the letter, turn it into a silly drawing, and then go back a trace over the letter with a crayon again. Seriously giggly fun. Not just because Daddy fell asleep in the background. I personally find most writing workbooks horrible, but this one, "Mr. Men Learn to Write" was fun. They didn't just slap on a character to the usual drills. To see her quietly absorbed in a pre-writing exercise was a big relief in contrast to the letter drills at school. Yeah, after a few pages this was inevitable. I'm just thankful her fine motor skills are getting better, hahaha. As a right-handed mom with a lefty-child, I read up on it and found out a lot of surprising things and guidelines to teach lefties how to write. 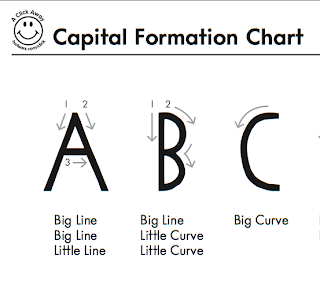 After I saw this drill in her take-home folder, I wrote to her teachers to pass a tip along: for lefties, put the guide letter to copy on the RIGHT side of the paper, not the left so that her hand won't cover it. Here's a bit of trivia I picked up: did you know that lefties tend to be smarter, better judges of character and better in certain sports? It's because the connections between the two hemispheres in the brain become stronger after being forced to compensate in a right-handed world. Her: Because I'm left-handed! And I'm smarter! 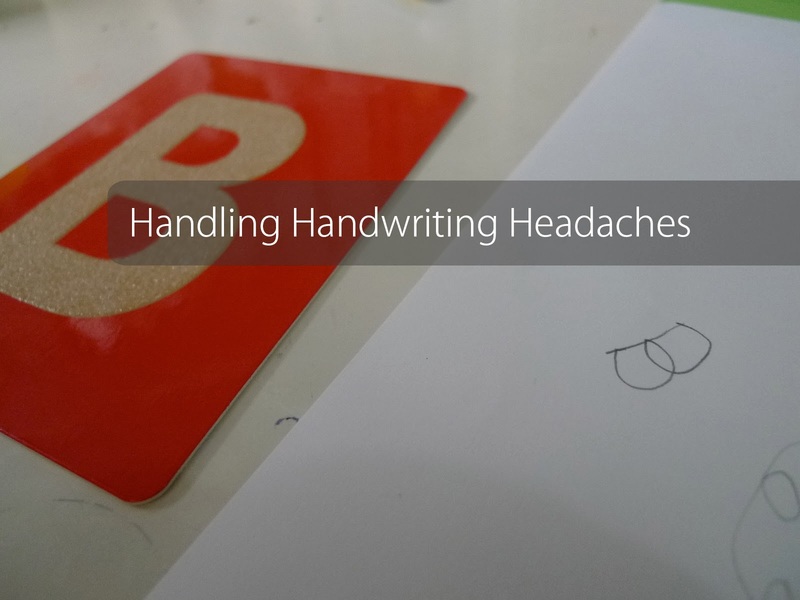 Our handwriting challenges continue today, and it's taking more patience than I thought. From her and from me too. I just need to keep telling myself to keep it relaxed and fun, and let myself be surprised. But supposedly by six years old next year, she should be tying a bow. I finally started a Facebook page. I would be honoured if you would follow our page and leave your thoughts! Same here!! I had to hunt for left-handed scissors and they are so hard to find because National Bookstore only stocks a few and they're always out. Have you found some in Australia and Manila? I also shared my favourite cutting practice workbook here: http://diycorporatemom.blogspot.com/2013/08/my-favorite-toddler-workbooks.html. Thanks for stopping by, Abigail! speaking of milestones, i also have stopped almost completely comparing mayumi with her age group because up to now SHE IS NOT WALKING (and she turns 2 in June). we've been to developmental pedias already and they just say she's hard-headed and is just freaking lazy. :p she speaks a lot though, already in 2 or 3 word combinations and can say her name. she points at her chest and says "Ich Mayumi Kuebel." she's also left handed and colors a lot right now and loves to use scissors. Hahaha I loved reading your comment/stories, C! That is not uncommon, and I'm glad you're not stressed over it! My very good friend in high school also went through the "just a lazy walker" thing with her third child and now she's dancing around - same age as yours too! Can you also share some left handed tips?! Okay I will do that too, but maybe too late for my five year old. It's always an afterthought to place things on her left though since I always place them on the right so now I'll try the middle! So glad you wandered over here, Shey! I love meeting new moms in our online world and peeking into lives outside of mine. I made the galleries link on the upper right side of the blog for an easy way to see what other ideas are here. Hope it's useful! P.S. Your DIY puzzle is super tyaga! I wish I had the patience and talent for something like that... one of my frustrations! Hmmm maybe I should let my daughter see me draw too, only I'm not a very good one!